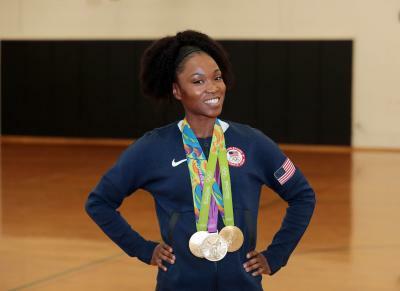 But before she became a legend on the world stage, the Elyria, Ohio native was establishing the trajectory of career at Ohio High School Athletic Association (OHSAA) Outdoor Track and Field State Championships in Columbus. Despite racking up a total of nine career high school state championships, she remembers the legendary run for more than simply the titles. Her favorite memory comes from her sophomore year, when she had won the long jump, but let her other events slip away with only moderate effort. She vowed that she’d rather go home a loser in the literal sense having not won an event than to go home and not have tried. And fearless she became. Bartoletta returned to the state championship the next two years and swept gold in the 100-meter dash, 200-meter dash, long jump and 4 x 100-meter relay. She became just the third athlete in Ohio’s history to win four events at the state championship two years in a row, joining the company of Susan Nash and Columbus legend Jesse Owens. The high school success was only the start of Bartoletta’s reign on the track and field world, but she has grown to recognize the importance of the experience as her career progresses. “Records are made to be broken and I think part of building a legacy comes with paying it forward,” Bartoletta said. She now travels around the country teaching the next generation with a three-hour workshop named The Crash Course, modeled after a 2016 e-book she authored during a time she faced adversity in her career. She identifies problems the young athletes may be having and proposes multiple solutions to each. From middle schoolers to post-collegiate athletes to coaches, Bartoletta wants to help anyone involved in the sport. In December The Crash Course drew Bartoletta back to Columbus, the very site of some of her first her career-defining moments at the OHSAA Outdoor Track and Field State Championships. You can follow Bartoletta on Twitter @tibartoletta and learn more about The Crash Course here. The Greater Columbus Sports Commission hosts 19 OHSAA State Championships annually, including the 2019 Outdoor Track & Field State Championship on May 31-June 1 at Jesse Owens Memorial Stadium. For more premier sports events in Columbus, check out our Events Calendar.